Bose to take on iPod? This is quite far fetched, but there are rumors that Bose will come out with a iPod type device on their March 2nd announcement. I HIGHLY doubt this. If anything, they will come out with a better iPod SoundDock to compete with a new Apple iPod HiFi speaker dock, or maybe they partnered to create it. 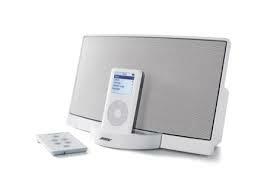 Apple did used to feature Bose SoundDock’s in the front window of their stores. I know someone who works for Bose, I’m pretty sure they’re just making it in black. A little late for that I think.